Organic chocolate today is moving from a niche to a mainstream and sought-after proposition. Capitalizing on persistent consumers’ interest in organic products, there are more and more organic offerings on the confectionery shelf, from established iconic brands, fancy boutique producers to own label as retailers have started recognizing the potential. Discover the various dimensions of how organic (aka bio) can manifest itself in chocolate confectionery and get inspired for your own product range. Green&Black’s proposition is centered around being Organic and allows them a key position in the premium section of the supermarket shelf. Fairtrade. As chocolate’s main ingredient is cocoa, organic sourcing often goes hand-in-hand with sustainability and fairness that are hot topics in the industry. Free-from. Vegan is another booming lifestyle choice and fits well with the better nutrition trend, perfectly complementing organic. Better-for-you (healthier ingredients). Organic implies ‘coming from nature’ and is therefore seen as more natural and healthier. To enhance that perception, various better-for-you such as ‘healthier’ sugars or superfoods are a no-brainer solution. 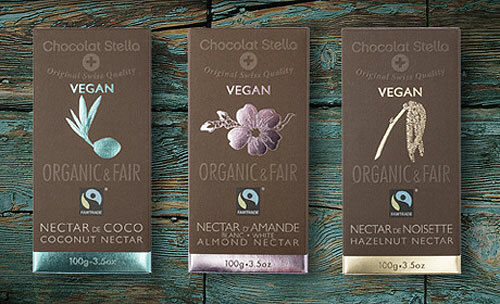 Chocolat Stella goes all-in with its organic & fair range which is also vegan and uses special nut nectars in the recipe. 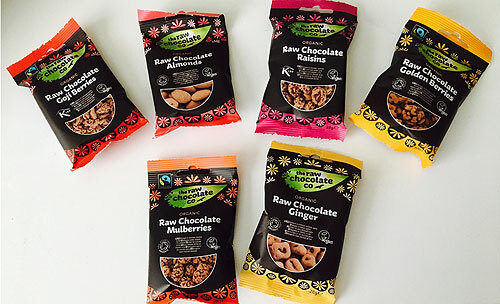 The raw chocolate co taps into the health trend with its organic chocolate nibbles with superfood cores. The raw chocolate co taps into the health trend with its organic chocolate bars. Today we’re observing a strong ‘less but better’ trend in chocolate confectionery. Consumers are cutting down on chocolate consumption because of its unhealthy reputation and are switching to higher quality products, which taste better, are more sophisticated or are better for you. All of those are typically more expensive but consumers are willing to accept it, driving the premiumisation trend. Launch a ‘base’ organic chocolate range, where all of the ingredients have to be sourced organically, from chocolate to nuts to others. Highlighting the cocoa percentage in the recipe will further strengthen the quality credentials. Explore smaller portions and thinner formats to dial up the healthier perception. Trade up even more by using a sophistication approach through single origins (direct link to organic cocoa) or exclusive ingredients (such as local, or special provenance inclusions). The ‘wild & organic’ Seed and Bean and their 100% cocoa Ecuador or the Sicilian Hazelnut tablets. Looking for organic chocolate and nut products for your organic innovations? Pure 100% organic hazelnut paste with a deep brown color. Freshly-cracked, medium-roasted Spanish organic hazelnuts have been finely ground into a paste. A natural way to bring an intense hazelnut taste without sugar. Also called "hazelnut butter". Perfect for non-dairy/vegan alternatives. Pure 100% organic Spanish almond paste with a beige color. Freshly-cracked, medium-roasted organic Spanish almonds have been finely ground into a paste. A natural way to bring an intense almond taste without sugar. Also called "almond butter". Perfect for non-dairy/vegan alternatives. Nicely balanced dark chocolate with a slightly higher cocoa note. Without addition of vanilla. The rheology is suitable for different applications. An organic dark chocolate with a strong cocoa flavor and without lecithin. This chocolate is perfect for enrobing and making hollow figures. An organic white chocolate with a very low cocoa intensity. Use this chocolate for molding. It has a great natural taste. An organic dark chocolate with a medium cocoa intensity. This chocolate has a great authentic and fresh taste and can be used for enrobing.